tl;dr My math compiles, but am I doing it right? From there, I want to get the resulting angle provided by dot calculation. In this example, X is normalized which according to Wiki(s) brings it to a value between 1 and -1, which if I'm understanding this correctly will help in determining the angle I am trying to calculate. Then get the normal result of the subtraction of two actor locations which I believe provides me with a straight line between the actors, or at least the magnitude of the line that goes through them. So now I have two resulting numbers, both between 1 and -1 depending on inserted values. So the code above is supposed to figure out the angle provided, and if the value of the cosine is greater than or equal to 0.7, then something happens. Is this correct so far? The math itself compiles, I'll post links I used for research. Also how the FRICK do I use Abs()? I can't seem to find any info on it and I am going to need it for a later part. "Cross Product And Dot Product: Visual Explanation"
Last edited by LannFyre on Tue Nov 22, 2016 7:45 am, edited 1 time in total. I'm sorry for the double post, but it is to bump the topic with an updated OP. I have done some more research into Vector math and I think I have a better understanding of the math now. But I still need some help in understanding the math I have posted. The math itself compiles, I just need assistance in getting a better understanding of the code I modified to work in UEng1. Maybe it the other way round is easier: describe what you want to achieve. And starting in 2 dimensions reduces complexity. See Wiki: Abs() expect exact one parameter of type float and returns the same value of type float with a positive sign. Barbie wrote: And starting in 2 dimensions reduces complexity. That's actually a very good starting point for most applications. I found that many problems become quite simple by solving them in a plane first. BTW: GetAxes() already returns unit vectors, so you don't need to normalize them again. Deleted and reposted to bump, was going to try to elaborate more on what I've typed but man I cannot think of a better way to describe what I'm attempting. So I guess just a bump, probably the last one if I can't get an answer on this. Barbie, hopefully this post clears up what I'm trying to accomplish. I need to determine the locations of two actors, get the rotation of one of them (which would almost always likely be a Pawn), then based on the other actor's location (a Camera), make the Pawn change its facing sprite. Like in Doom. So what I'm trying to do with the math is figure out what angle the Camera is from the Pawn, then tell the Pawn what sprite it should change to. I should also mention that this check is happening on tick(), so it has to be kept minimal because it is constantly being called for multiple actors for multiple sprites. I am trying to make a Doom-like sprite system. The "sprite" is a polygon in 2 dimensions only, called "sheet" in UnrealEd terms (I've never played Doom). You have several sheets and depending on the angle of view one of these sheets should be drawn. To be more concrete to your case: putting the sheet in the origin of a two-dimensional Cartesian system, one of four sheets should be drawn depending on the quadrant the viewer (camera) is in (see en.wikipedia > Quadrant for details). Is this correct so far? BTW: changing the sheet must of course be done on client side because it sheet selection depends on Player's position. Barbie wrote: You have several sheets and depending on the angle of view one of these sheets should be drawn. - I have multiple sheets which will be stored in an array in a native object, that are swapped out depending on certain conditions. There is a manager that checks for multiple copies of this native in the level, cycles through the native's current stored sheets in the native's array, and sets the actor's (pawn) texture to whatever sheet occupies the current position in the array of textures. - The native object temporarily stores multiple sheets, so they are constantly swapped out. The native object will also store a value that will be changed based on where the camera is in relation to the pawn, but first the math to determine where the camera is to the pawn (or vice versa) needs to be figured out. - Think of a light actor in the editor, notice that when you spawn it the actor has its drawtype set to DT_Sprite, and it holds a texture. The texture is drawn as a flat sheet. So the idea is to make it so the actor's current sheet is constantly being swapped. Barbie wrote: To be more concrete to your case: putting the sheet in the origin of a two-dimensional Cartesian system, one of four sheets should be drawn depending on the quadrant the viewer (camera) is in (see en.wikipedia > Quadrant for details). Is this correct so far? Correct mostly, except instead of 4 sheets, it will be 8 sheets. 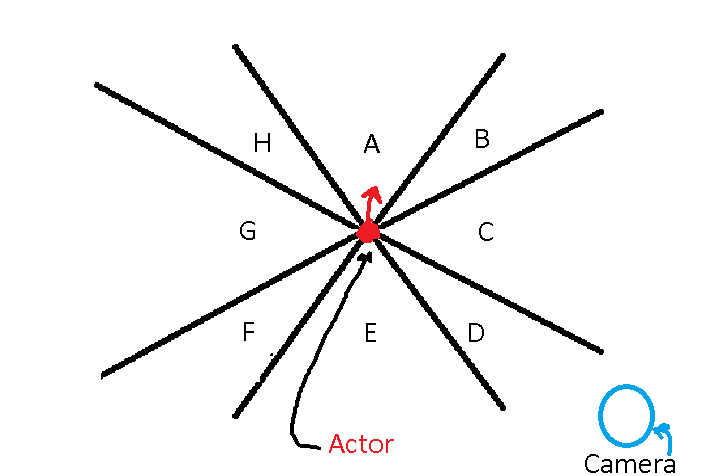 8 different directions that the actor can be viewed from (North, NorthEast, East, SouthEast, South, Southwest, West, Northwest). View the spoiler in my previous reply and the OP if you need a visual understanding of how this is intended to work. This is a good suggestion, I'll keep it in mind. Let's see if that goes into the direction of what you want to realize: I've created a test map with a custom actor nearby the centre of the map that changes its texture depending on PlayerPawn's location. The 3rd dimension (z-axis) is completely ignored there so that any action depends on x-y-plane only. Also I have used 4 shapes only, but that is expandable without problems. The underlying mathematics is easy: first move the coordinate system into the view target. That is simply done by subtracting viewer's and view target's location what results in vector V. Then determinate the angle of that vector to the the x-axis. First I messed around with trigonometric functions, but a Rotator conversion does that very easy and perfectly; only its yaw component is of interest here. As you can see in the draft, the yaw runs from 0 to -32k when the viewer moves from quadrant I to II; if he moves from IV to III, the yaw runs from 0 to 32k. The task now is to assign a texture depending on the range the yaw is in. A big BUT: the way I implemented that is the worst way - instead of executing in a timer or even worse in a tick function that code should only be called when the drawtarget is to be drawn. Maybe the functions RenderOverlays/RenderTexture will do that job - I'm not familiar with them. That being said, thank you @Barbie, I'll post a little later today or maybe tomorrow with a video to preview how this works. I just had the thought that I could try something involving VisibleActors for choosing who should be updated. The camera is a ScriptedPawn, so we'll see what I can figure out with that. The rotation math will be used in one project for sure, but I really want to port some of the assets I have set up in my UGold mod to UT for some sort of third person wave survival single player game with stock UT 3D models, due to some important functions that are being used in sprite animation being only available in UGold. @Wormbo , can you take a look at a corrected version of the math I had provided above and explain it in a way that utilizes Barbie's graph? While Barbie's math will check for relative positions of actors, it isn't accounting for the forward facing direction of the pawn. While in normal conditions it should log something (a number from 1 to 4) ALL of the time, check if it doesn't logs anything as well, because the probability of some small error, bug, typo, etc slithering that chews on algorithms can be a bit bigger than you expect. Unless you take your efforts and do an intensive and tedious scan of the whole code. It still won't be as effective as to dizimating these code snakes (or whatever they are, that should like chewing on that. Maybe goblin? Hm.. foxes! There is one that chews me all the time. But I'm not code so maybe not...). Gustavo, I know what the log functions do. I mean the math, I was asking for a step-by-step on the math. For instance, I need a bit more of an explanation on the 0.7 and 0 comparisons in the math and what exactly would be happening with that. And I could also use a visual example of what any of the math examples are doing, drawn on Barbie's graph. ...also wat dafuq, foxes, sneks, goblins? LannFyre wrote: Gustavo, I know what the log functions do. I mean the math, I was asking for a step-by-step on the math. For instance, I need a bit more of an explanation on the 0.7 and 0 comparisons in the math and what exactly would be happening with that. And I could also use a visual example of what any of the math examples are doing, drawn on Barbie's graph. Yes, it was just a side note. // called per client that inserts the player as argument? By the way, the goblin is a reference to the UnrealEd goblin, just a random meme about UnrealEd crashing. The fox is a reference to... one of my IRC friends.